Obituary for Dorleen (Bradford) Ryman | Providence Funeral Homes & Crematorium Inc. It is with heavy hearts we announce the passing of our mother, Dorleen Ryman. 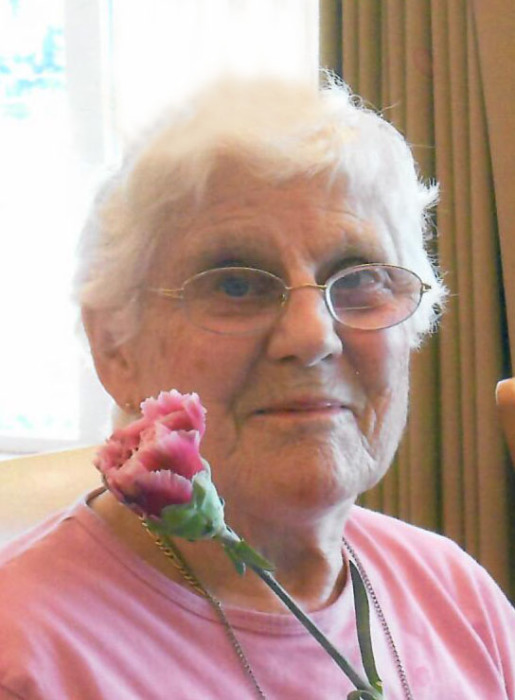 Dorleen was born July 6, 1924 in Nelson, BC and passed away on January 26, 2019 at Haven Hill Retirement Centre in Penticton, BC with her family by her side. Mom is finally at peace after having fought a lengthy battle with dementia. She has moved on to join her beloved husband George, grandson Lee, her parents John Geoffrey and Florence Amy (Skinner) Bradford, 5 brothers, and 4 sisters including her twin at birth. Mom moved to many locations around BC and attended many different schools. She graduated from Armstrong High School in June 1943 and after working for a time, attended the Royal Jubilee Nursing School in Victoria, graduating with her RN in May of 1947. It was while she was in Armstrong she met her life long partner, George Ryman and they married after she graduated as a registered nurse. They were married in Enderby on June 14, 1947 and moved to Summerland Experimental Farm, where Dad was employed. Mom was a highly respected RN at both the Summerland and Penticton hospitals over the course of her career. She then moved into Public Health until her retirement. Mom enjoyed her volunteer work with the Kiwanis Club of Summerland, the Canadian Cancer Society, Girl Guides, CGIT and RECope. Mom also enjoyed listening to music, playing the piano, working in her garden, brisk walks, knitting, and painting. Mom will be lovingly remembered by her children: Pat (Don) Simmons of Vernon, Ron (Linda) Ryman and Ken Ryman of Kelowna, Kathryn (Daryl) Jenner of Summerland, 11 grandchildren, 12 great grandchildren, 3 great great grandchildren, sisters June McKinley of Calgary, AB and Rose Smith of Carstairs, AB, and sister-in-law Millie Bradford of Kelowna, as well as many nieces and nephews. The family would like to thank the nurses and care aides at Haven Hill Retirement Centre (Lower Cherry) for the loving care they provided Mom during her stay. A Celebration of Life will be held at 11:00 a.m. on Saturday, February 2, 2019 at Summerland United Church, 13204 Henry Ave., Summerland, BC.